As Myanmar's military adjusts to life with its former opponents holding elected office, Conflict in Myanmar showcases innovative research by a rising generation of scholars, analysts and practitioners about the past five years of political transformation. Each of its seventeen chapters, from participants in the 2015 Myanmar Update conference held at the Australian National University, builds on theoretically informed, evidence-based research to grapple with significant questions about ongoing violence and political contention. The authors offer a variety of fresh views on the most intractable and controversial aspects of Myanmar's long-running civil wars, fractious politics and religious tensions. 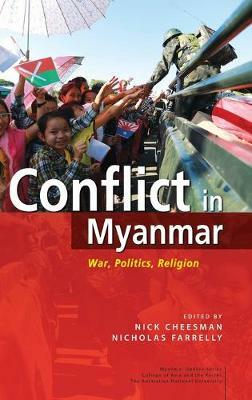 This latest volume in the Myanmar Update Series from the ANU College of Asia and the Pacific continues and deepens a tradition of intense, critical engagement with political, economic and social questions that matter to both the inhabitants and neighbours of one of Southeast Asia's most complicated and fascinating countries.